TORONTO – The Student Union Building at New Mexico Highlands University in Las Vegas, New Mexico has achieved LEED Gold certification from the U.S. Green Building Council. 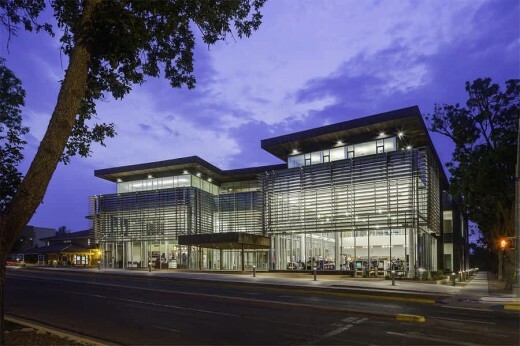 Designed by Diamond Schmitt Architects in joint venture with Studio Southwest Architects, this highly efficient and sustainable facility is responsive to the American Southwest climate. A sun-filled three-story atrium anchors the 65,000-square-foot facility, which has dramatic exterior cladding of black iron spot brick, Cor-Ten steel panels, and a glazed aluminum curtain wall. One of the first motorized sun tracking louver systems in North America is mounted on three sides of the building. It shades the interior from direct sunlight during the day and opens during the night. “The louvers are held two feet off the main façade and begin ten feet off the ground, allowing sun shading to the grade levels without compromising transparency and view,” said Martin Davidson, Principal at Diamond Schmitt Architects. Additional energy-saving initiatives include a geothermal well system with two chillers that meet 100 percent of the building’s heating and cooling needs. Energy-efficient lighting and electrical systems in combination with the sunshades reduce by 260,000 kilowatt-hours the annual energy use. This saving resulted in the local utility providing a $26,000 rebate to the university. To prevent heat gain and glare on the third level, the floor plate is set back under large overhangs for passive shading and to reduce the building’s overall scale. Green roofs are planned for the future that will have terraces with views to the mountains beyond. Student lounges on all three floors surround the atrium, and above ‘floats’ the governance chamber encircled by skylights. The building also houses a ballroom/conference facility, theater, bookstore, café, and a cafeteria that opens onto a sheltered courtyard, meeting rooms, and a dining area. 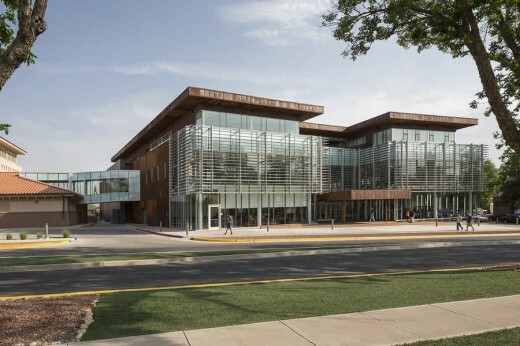 This gateway building anchors a key intersection of the university and has a series of interconnected and transparent volumes that are legible and inviting from the street. A mix of one and two-storey program spaces animate the interior while the atrium acts as a circulation hub connecting the various elements. 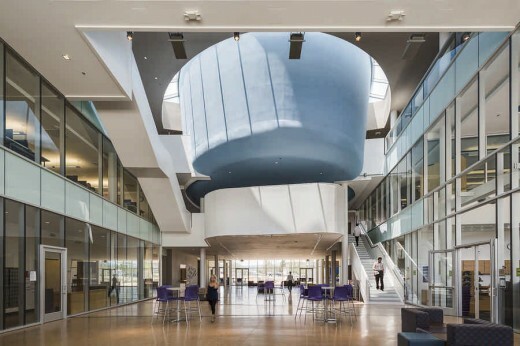 TORONTO – An innovative and highly sustainable building has opened at New Mexico Highlands University. The Student Union Building is designed to respond to the American Southwest climate and connects the campus with the community of Las Vegas, New Mexico. The gateway building anchors a key intersection of the university and presents a series of interconnected and transparent volumes that are legible and inviting from the street. Responding to a university need to produce both new and dedicated spaces for student activities in one location, the building organized a mix of one and two-storey program spaces around a three-storey light-filled atrium. Student lounge spaces on all three floors animate the atrium while this central space acts as a circulation hub connecting the program elements. A key feature is the 75-seat student governance chamber that floats above this central space; to enhance its presence, natural light washes the curved surface of the chamber drum. Designed by Diamond Schmitt Architects in joint venture with Studio Southwest Architects, this 65,000-square-foot facility has a dramatic exterior cladding of black iron spot brick, Corten steel panels and a glazed aluminum curtain wall. On three sides is one of the first motorized sun tracking louver systems in North America that shades the interior of the building from direct sunlight during the day and opens during the night. “The louvers are held two feet off the main façade allowing sun shading to the grade levels without compromising transparency and view and the system drastically reduces mechanical loads”, said Martin Davidson, Principal at Diamond Schmitt Architects. The ground floor contains a versatile ballroom/conference facility, theatre, bookstore, café, post office and cafeteria that opens onto a sheltered courtyard. The upper floors include lounges, a computer lab, student services offices, meeting rooms, a dining area, the student governance chamber and a bridge to an adjacent library. The third floor is set back under large extending roof planes that reduce the overall scale of the building and provide shade and covered terraces. Future green roofs provide rooftop assembly areas with views to the mountains beyond. The building is targeting LEED Gold certification and a geothermal well field is part of the mechanical energy system. Diamond Schmitt Architects is a leading full-service architectural firm based in Toronto with an international reputation for design excellence and sustainable design solutions. An extensive portfolio includes academic buildings, libraries, performing arts centres, sports facilities, master plans, residential and commercial buildings. Equally extensive is work completed for healthcare, with life science facilities, research laboratories and hospitals.